Can Dabang Delhi erase the ghosts of its past? Dabang Delhi has portrayed itself as one team that lays out a lot of promise but has faltered in all the seasons thus far. With a 6th place finish in the inaugural season its best finish from five seasons, there is much that is left wanting for any Dabang Delhi fan. Now, with the Pro Kabaddi League 2018 fast approaching, Dabang Delhi will hope to rectify what went wrong from the past seasons and regroup under skipper Meraj Sheykh, who will hope to see a change in fortunes this season. Opting to shuffle its squad apart from the lone retention of Meraj Sheykh, Delhi did well in the auction to add teeth to the overall balance of the squad. Shabeer Bapu, who has drifted into the players' shadows could be leading the raid department which will also feature the likes of Chandran Ranjith and Pawan Kumar Kadian. Ravinder Pahal returns to the team he started off with and partnering him in the defensive setup will be Vishal Mane, Satpal, and Viraj Vishnu Landge, who had an excellent outing last season. Left corner defender Joginder Narwal will be manning the left corner while Rajesh Narwal's all-round ability will certainly come to Meraj Sheykh's aid. Here are five players from this year's squad, who can be expected to give the opposition a run for their money. Fondly referred to as 'The Hawk' for his extreme skill on the right corner position, Ravinder Pahal's return to Dabang Delhi could well fuel his intent to perform well and his alliance with Joginder Narwal on the right corner could be a massive influential factor for Delhi. 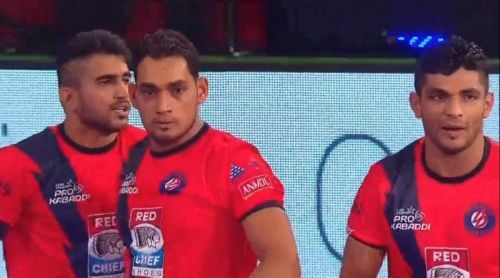 Pahal played the first three seasons with Delhi and in the second season, finished as the best defender with 64 points from 14 matches. In the previous season with the Bengaluru Bulls, Pahal picked 54 points from 19 matches, an average outing and he will be waiting to strike when the chance arrives this season.